" I am much happier with the cloth mask than a plastic one since I am a side sleeper. " " Very comfortable, allows me plenty of movement without a problem. Finally a good nights sleep using this infernal machine! " The SleepWeaver Anew Full Face Mask with Headgear lets Full Face mask users enjoy the Soft side of sleep therapy! Leave the hard, heavy, hot mask behind and step up to the lightweight comfort of a soft cloth mask unlike any other full face mask. The Anew Full Face Mask uses the proven mask technology found in the SleepWeaver Advance Improved and SleepWeaver Elan. The breathable material wicks moisture away from the skin to offer lightweight comfort. The cloth cushion is worn loosely for comfort and reduced strap marks. Circadiance offers a 30 day money back guarantee on the SleepWeaver Anew. If unsatisfied with the SleepWeaver Anew contact CPAP.com for return information. The SleepWeaver Anew is made by Circadiance, the Cloth Mask Company, known for innovative designs. The SleepWeaver Anew Full Face Mask offers users a soft, lightweight seal using breathable material designed to pull moisture and heat away from the skin. 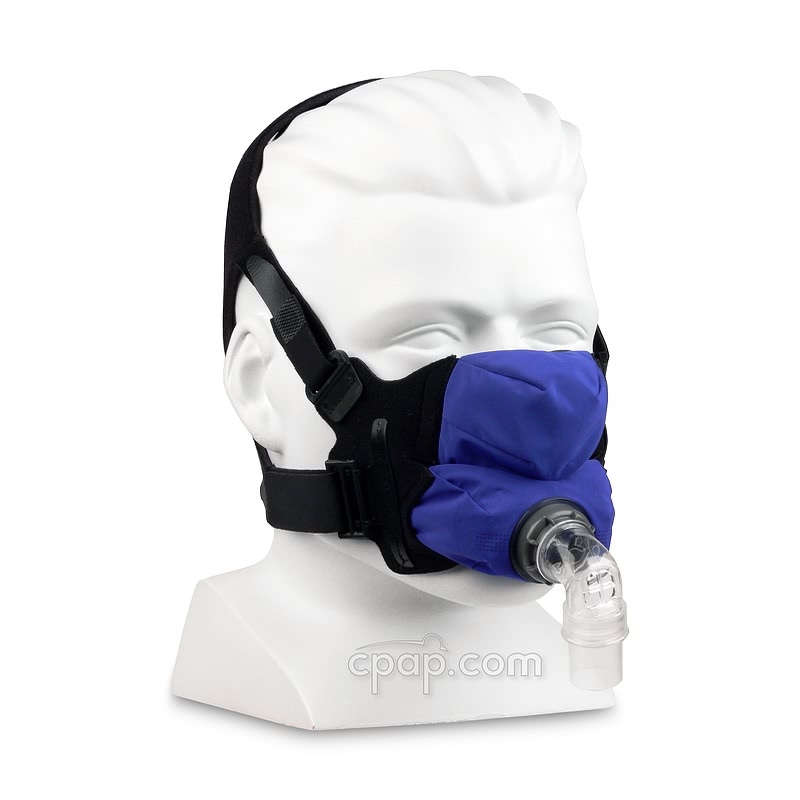 The soft material of SleepWeaver Anew sets it apart in the world of rigid CPAP masks. The unique dual chamber design inflates to seal around the nose and mouth. As the cushion of the SleepWeaver Anew inflates with the flow of CPAP air it "balloons" against the face to create a seal. A gentle bubble of cushion omits jaw and face pressure sometimes associated with hard plastic mask frames. Made of an extremely durable fabric, the cushion of the Anew is designed to 'breathe' to reduce trapped heat or moisture against the skin. Further, a cloth cushion eliminates pressure points and vastly reduces the chances of morning red marks. The Anew exhalation 'ports' are located on either side of the elbow. 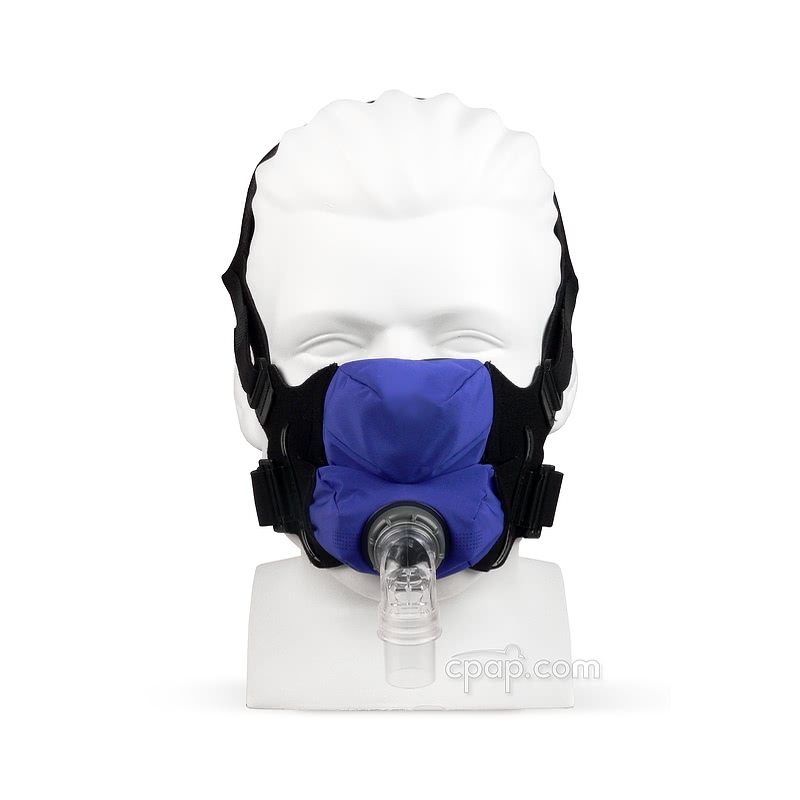 They are designed to offer quiet exhalation of the exhaled air. When putting on the Anew, the cushion size label should be on the bottom of the oral or mouth cushion. Fit the inflated mask using the adjustment tab at the center bottom of the cushion. Adjust the position of the mask to get the best seal. Visit the "Videos & FAQ" Tab of this product page to view video information about the SleepWeaver Anew. The Anew is available in three sizes: Small, Regular and Large. 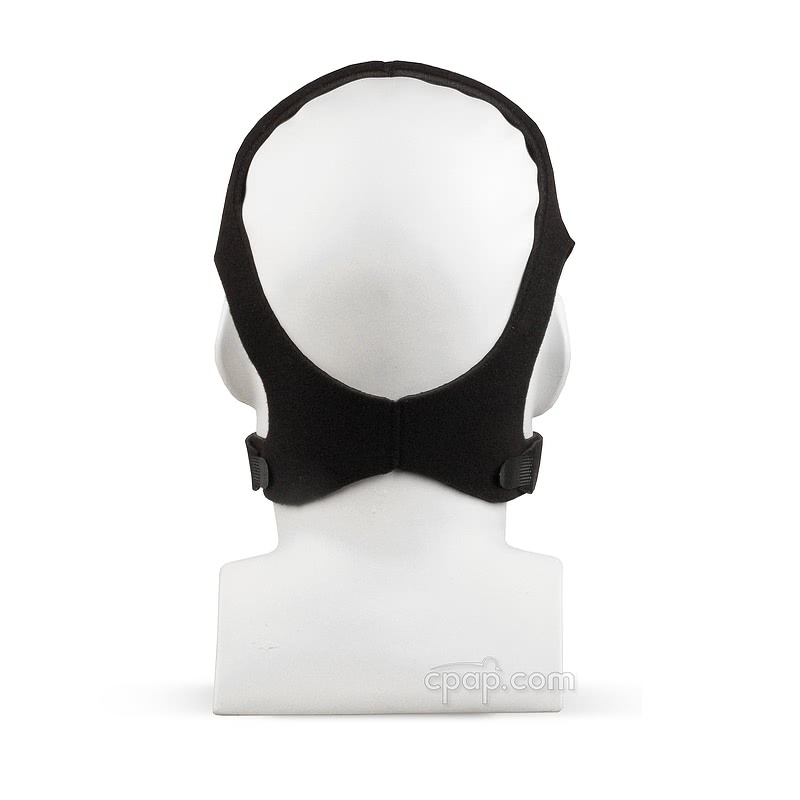 The Anew headgear is designed to support and stabilize the seal without the use of a forehead support or strap. A clear line of sight makes reading or watching TV more comfortable. The minimal design reduces the weight of the mask and limits contact to the face making for a more pleasant sleeping experience. The 360º of elbow rotation provides options for users of the Anew. The hose can be routed down the chest; to either side; or up over the head. 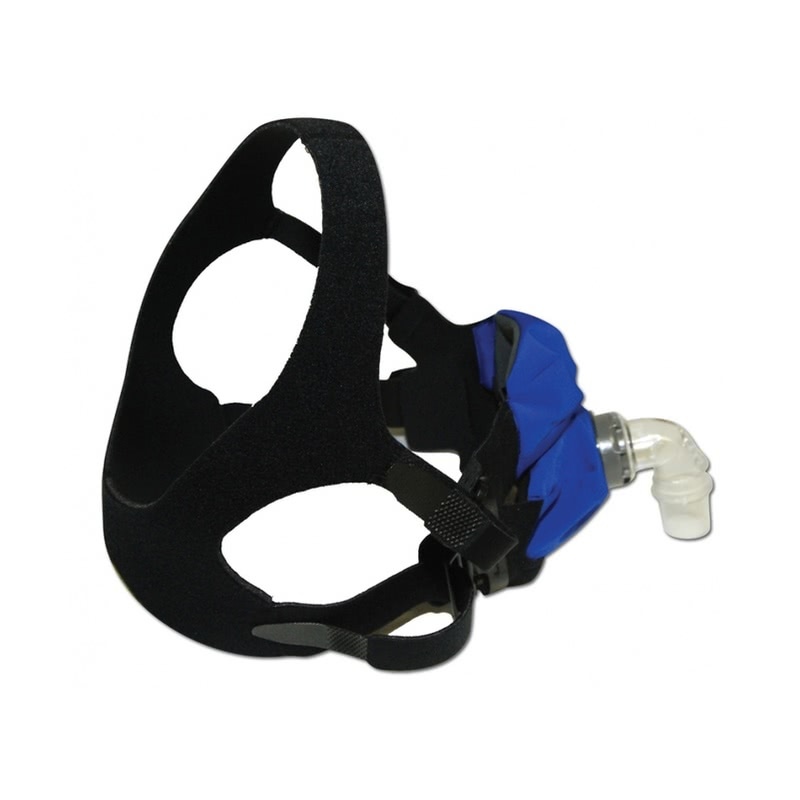 The optional Tether Strap for SleepWeaver Masks can be used to attach to the headgear and secure the hose over the head. The cloth design of the SleepWeaver Anew is ideal for travel. The weight is much less than the average full face mask, the Anew will not add bulk to the carry on. 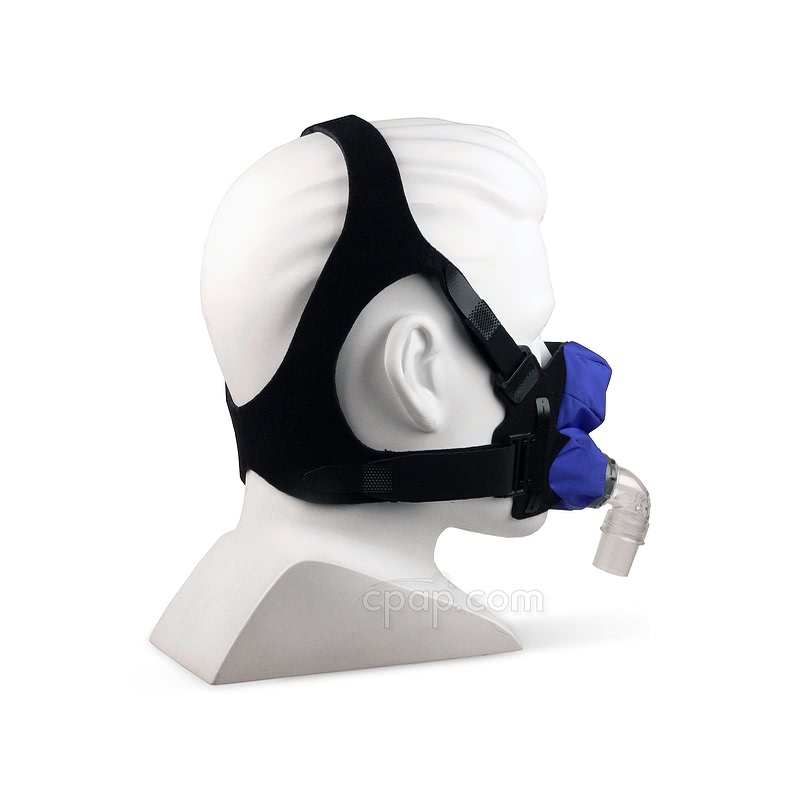 Just unfold it after travel and the flow of the CPAP air will inflate the cushions. The SleepWeaver Feather Weight Tube is 18 inches of highly flexible, lightweight tubing. The lightweight hose reduces drag on the mask and allows freedom of movement to limit the chances of disrupting the seal. The optional Tether Strap for SleepWeaver Masks to route the tube up over the head and secure it to the headgear. 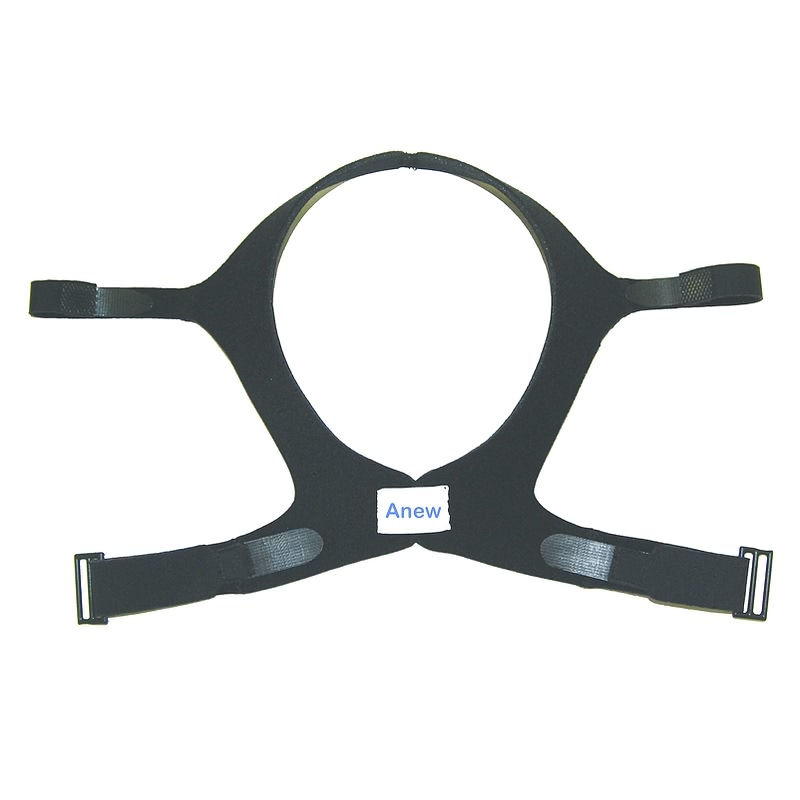 The Regular and Large size Anew masks come with the size Standard Headgear. The Small Anew comes with the size Small Headgear. To find the size of the mask, turn the SleepWeaver Anew™ so the elbow is facing the user. Just below the edge of the elbow, the user wil find a series of information printed on the blue cloth mask. The middle line indicates the size of the mask by displaying the word: " S M A L L," "M E D I U M," or "L A R G E."
It is best to hold the mask in a well lit are when looking for the size." Hand wash in cold to warm water. Do not use hot water. Use non-abrasive, mild detergent such as Liquid Tide. Do not use soaps or detergents which are anti-bacterial or high in oil content. The manufacturer of SleepWeaver mask products recommends against using baby shampoo or high oil soap or shampoo. See the Specs Tab of this product page for a complete list of manufacturer approved cleaning methods. Rinse the mask well under running water. Do not clean the Anew using a washing machine or clothes dryer. 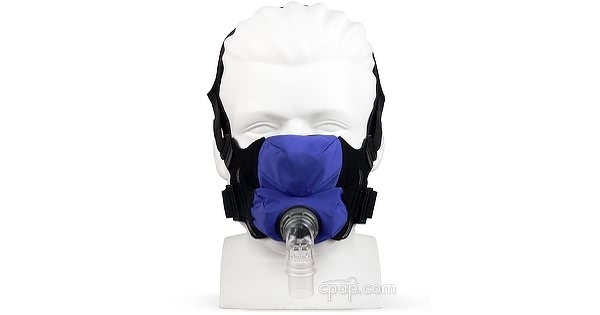 Humidifier Use: All SleepWeaver Cloth Masks are compatible with the use of a heated humidifier. Adding Oxygen When Using the Anew: the Anew does not have a supplemental oxygen port. 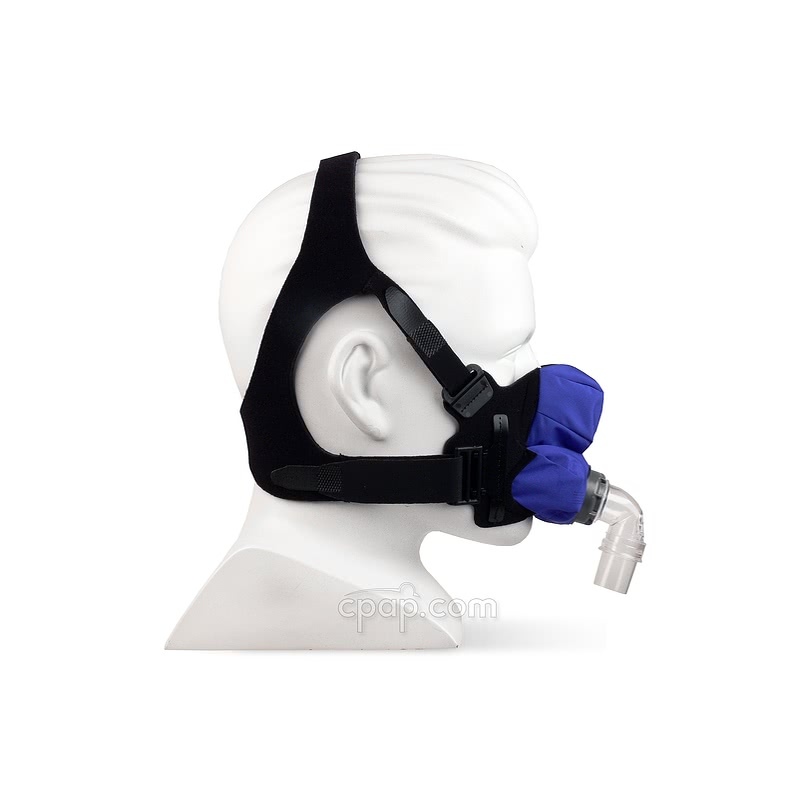 Oxygen can be added to the therapy air way using adapter between the long hose and the CPAP machine. 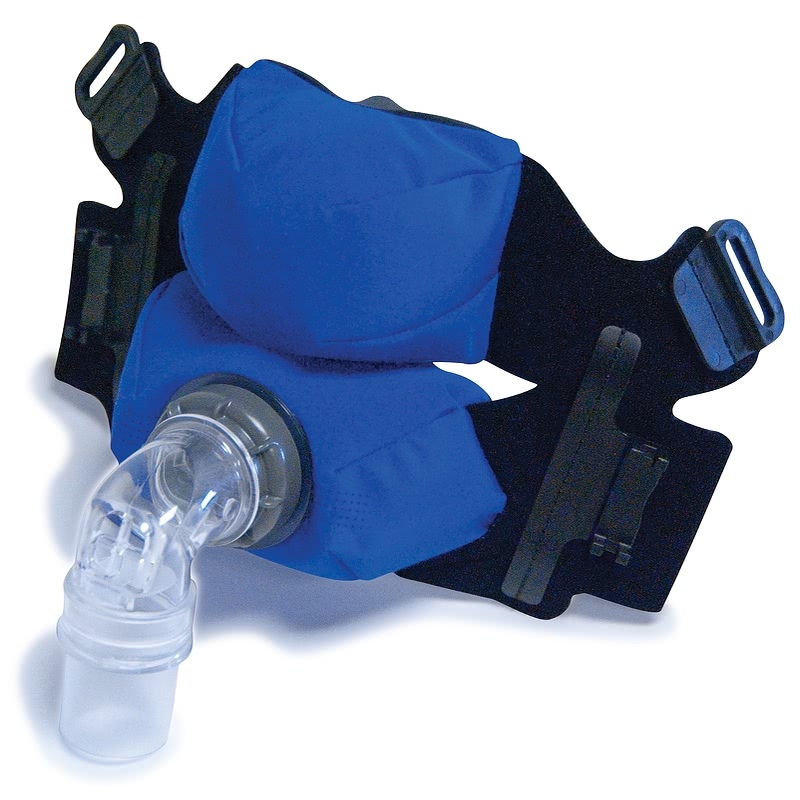 To view and order an adapter visit this page: Oxygen Enrichment Adapter. Anew and Headgear Material Content: As are the other soft cloth masks by Circadiance, the breathable cloth material is made of polyester, nylon and elastane. The headgear is made of lycra, nylon and foam. The Anew does NOT contain latex, mercaptobenzothiazole or Mercapto MX. The Anew headgear is compatible only with the Anew Full Face Mask. It will not work with other SleepWeaver Soft Cloth Masks. Anew Color Option: The Anew Full Face Mask is available only in the color Blue. User Weight Requirement: The SleepWeaver Anew is for use by people weighing at least 66 pounds. Pressure: The SleepWeaver Anew seals by the air pressure inflating the Anew cushion. By design the SleepWeaver cloth masks excel at high pressures.